Commentary: Where are the mavericks in the Democratic Party? If the Democratic Party really admires "mavericks" so much—why don't they have one? Since a brain tumor claimed Sen. John McCain's life, Democrats have been effusive in their praise of his "maverick" style of politics. Senate Democratic leader Chuck Schumer called him one of the "few truly great people….a truth teller, never afraid to speak truth to power in an era where that has become all too rare." Top House Democrat Nancy Pelosi said "America is in tears over the loss of a great man." Hillary Clinton praised him for his "example of working across the aisle," while former President Barack Obama urged grieving Americans to "aspire to the courage to put the greater good above our own." If we've learned anything this week, it's that America's Democrats loved John McCain. So why don't any of them want to be him? Who is the John McCain of the Democratic Party? The "maverick" who disagrees with his or her party's orthodoxy and is willing to confront it? Is there such a figure? Instead, an analysis of Congress by the Lugar Center found that, of the top 10 most bipartisan U.S. senators, just one—Joe Donnelly of Indiana—is a Democrat. Overwhelmingly, most of the "reaching across the aisle" is reaching from the Right. Yes, there are a handful of Democrats in red states who occasionally vote with Republicans— Sens. Joe Manchin of West Virginia and Heidi Heitkamp of North Dakota come to mind. But they're not "mavericks" bucking their party's ideology. They're just Democrats in Trump Country trying to figure out how Democratic they can be and still get re-elected. How about one of the members of the Senate "Pro-Life Democrats" caucus. Oh, wait—there isn't one. Because there aren't any pro-life Democrats in the Senate. Sometimes senators like Manchin, Joe Donnelly of Indiana and Bob Casey of Pennsylvania are characterized as "pro-life." But their current scores from the National Abortion Rights Action League are 72, 74 and 100 percent, respectively. In a party whose chairman pledged the Democratic National Committee would only support pro-choice candidates (before he was forced to walk it back), this is hardly a surprise. The point is not that whether the pro-life or pro-choice position is the right one, but rather that the same Democrats who are celebrating McCain's political heterodoxy demand ideological purity from their own members. To many on the Right, who weren't big fans of McCain precisely because they disagreed with him ideologically, it appears what the Democrats and media are really celebrating isn't McCain's "independence" but rather his willingness to oppose the GOP. Not to be outdone, USA Today offered "Six memorable moments when John McCain earned a reputation as a 'maverick.'" Same thing. They include McCain saving Obamacare and supporting amnesty for illegal immigrants. Political courage, it appears, seems to inevitably involve voting against the Republican Party. 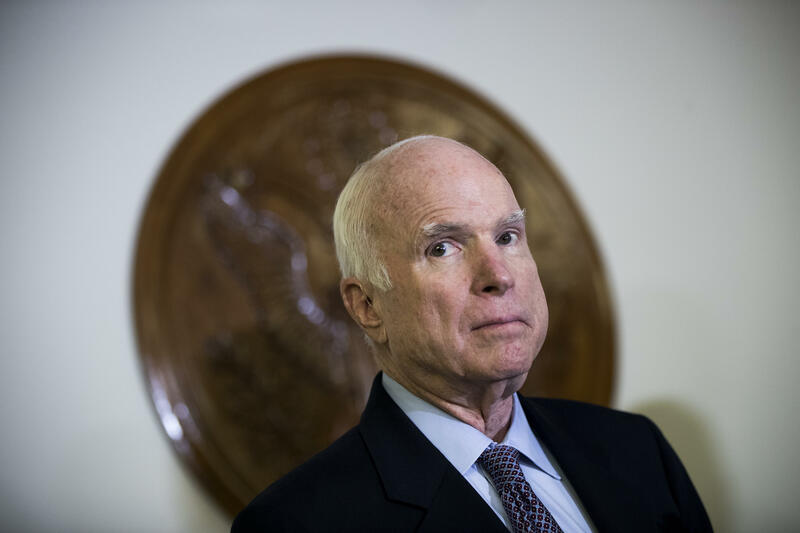 The media can't stop admiring the many times Sen. McCain took to the floor of the Senate to criticize Republican positions on issues like immigration or campaign finance reform. OK, fine. So where is the Democrat who's done the same? That speech will never be given, because there isn't a single "maverick" on the Democratic side of the aisle to give it. Or how about this one: "My fellow Democrats, the American people elected Donald Trump. I think he's a terrible president, and I disagree with him on almost everything. However, I respect the democratic process and I believe it is wrong to spend so much time and effort trying to de-legitimize his election or plotting for his future removal. We owe the voters the respect of doing our jobs, compromising when we can, and moving legislation forward—even if that means working with Donald Trump. It is wrong for us to be the party that #Resists the outcome of an election." A speech like that would actually help create the sort of bipartisanship we've been celebrating in the life of Sen. McCain. The tricky part: Finding a Democrat with the courage to give it. They would be ostracized from their own party. Don't believe me? Ask Joe Lieberman. In 2000, he was the Democrat's nominee for Vice President of the United States. In 2006, he was driven out of his own party in a primary and had to run as an independent to hold onto his Connecticut U.S. Senate seat. What was Lieberman's alleged sin? Working to closely with Republicans. One in particular: Sen. John McCain. What Sen. Schumer and President Obama and MSNBC are celebrating isn't McCain's independence, it's his willingness to join the Democrats and their cause. And we know it's true because a Democrat who showed the same willingness to work with the GOP wouldn't be praised. She would be a pariah. For many Americans on the Right, the real lesson of Sen. McCain's career as a "maverick" is that the definition of bipartisan is a group of Democrats and Republicans getting together to act like Democrats.